2 days of qualifiers and yesterday’s first finals today was the icing on the cake. In his opening speech Mr. Morinari Watanabe, the President of the FIG said, that here in Antwerp, the city of diamonds, they should shine like one. They sure did! Today we’ve learnt the names of the rest of the 2018 World Champions. In the first final of this afternoon session we watched the Women’s Pairs competing for the 2018 World Championship. There were no surprises in this final! The standings after the final competition are exactly the same as after the 3 rounds of qualifiers. The first pair on the floor were Portugal’s Candeias & Nunes who qualified from the 7th place. This morning for their combined routine they scored 27.280 and in the finals they were awarded slightly lower execution score which totalled to 27.030 and the ladies finished in 6th place. 5th place belongs to the team from United States Davis & Rosilier, the Pan American Champions scored 27.930 for their final routine, 0.05 less this morning. Their gracious routine, dramatic performance to Sound of silence by Disturbed, got them a well-deserved great ovation from the crowd. Just outside the podium, in the 4th finished the team from Ukraine. It is also the first senior year for this elegant partnership. Awarded 27.670 in the morning qualifiers, the nice and cheerful routine, really well-played with facial expression in the final scored 28.020. Lefkovits & Surzon won a bronze medal for Israel. Very precise execution and mesmerizing elegance of their combined routine in the final added a whole point 1 to the morning score Once again, Israel artistry value was the highest in their category, 9.150 which was important contribution to their 29.100 overall score. People’s Democratic Republic of Korea with a charming orchestra routine with the highest difficulty among the Women’s Pairs scored 29.120 outscoring the morning 28.470 in qualifiers and winning another silver for North Korea. The gold medal goes to Russia. After having won two golds yesterday in the Women’s Group and Men’s Pair event, the country’s medal tally got another gold to add to it from the double Daria's defending World Champions and World Games Champion. 4th after the first day of qualifiers with their compelling performances got back to the leading position and no one could take the win away from them. They even managed to improve their morning score of 29.530 by 0.3 and finish with amazing 29.830 confirming their dominance in the Women’s Pairs event. In the Mixed Pair competition the history was made today. Marina Chernova became the first Acrobatic Gymnastics athlete ever, who became the World Champion three consecutive times. Together with her partner Georgii Pataraia she won second World Championship in a row. In the finals they improved the morning score and finished in the well-deserved first place with 30.640. This is how legends are made! In the second place was the pair from Belarus, they had a little wobble that Konstantin brilliantly saved with no harm to the balance combination and they even added a 0.1 to this qualifying combined routine score of 29.230. With 29.330 Hanna & Evstafeev won silver. The bronze medal was loudly celebrated! For Belgium's Marte & Bram. captured bronze in front of their Home Crowd. Their gentle and graceful routine scored 28.330 this morning. In the finals they outdid themselves and scored 29.180 and received massive ovation from the audience. Not bad for first year Seniors, not bad at all! Azerbaijani pair also improved their morning score by 0.05, but 28.280 for Gurbanli and Al-Mashaykhi was not enough for a podium. Nonetheless, the pair deserves big congratulations as it is a huge improvement compared to 2016 World Championships, when they didn’t even qualify for the finals. You should be very proud of yourselves! We’ve known Bordewijk andBriggen from the Netherlands for their emotional routines. The execution of their combined routine in the qualifiers scored 27.440. In the finals, empowered by the large representation of Dutch fans they performed another gorgeous routine and scored fantastic 28.065. They did not manage to score enough for a medal, but hey, 5th in the World is an awesome result! In the final position of the rankings is the Mixed Pair form Poland. Kowalewska and Zabierowski whom we also saw in Baku 2015 were the first and only qualifers for Poland in the finals of this World Championships. Their final routine scored 26.330 but just their qualification is already a huge success as it was the first final in World Championships for Poland since 2014. 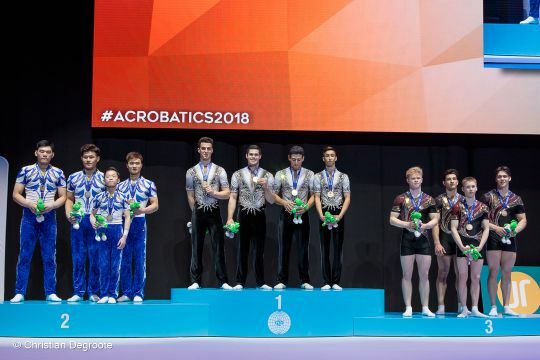 The spectacular Men’s Group event brought not only a variety of outstanding routines, but also a fantastic surprise in the standings. Opened by Belgium, who once again performed their routine to Michael Jackson’s medley today and immediately became audience’s sweethearts. Scored a bit less than this morning, but 29.040 for Anthoon, Garre, Geusens and Noam Raj Patel is still a great score. The boys placed 5th overall but got the 1st place in audience’s heart! In the 6th place finished the group from Germany Grohmann, Kuehne, Leppuhner and Maedler scored 27.290 after a deduction of 0.3. Very entertaining routine was well received by the audience, but sadly this was the last we’ve seen of this formation. The German boys decided to finish competing as a group after this World Championships. Amazing way to end their career among the best ones in the World! The bitter 4th place belongs to Portugal: Pereira, Piqueiro Silva and Silva increased their marks from this morning from 29.710 to 29.860 for their Moonlight Sonata routine. It’s worth noting, that this formation until the end of the year competed in 12-18 group and this is their first year in the senior division. What a fantastic achievement for such a young formation! And finally – the unexpected turn of events in the podium placings. 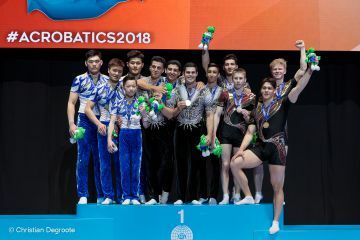 The bronze medal was won by the Russian group Kudriashov, Sorokin, Tukhashvili and Zadorin with their mighty routine also improved the qualifying score of 29.930 and with 30.130 took the bronze. That is the only medal won by Russia in the Senior Event other than Gold, but still a great achievement, as in Putian Russia did not have a formation on the podium in this event. Finally, the fiercest rivalry happened between the winners of the first two places. Fu Zhi, Guo Pei, Jiang Heng and Zhang Junshuo from China, who “overthrew” the defending World Champions in the qualifications where they scored 30.030, in the finals increased the score to 30.230, which was just enough for a silver medal, but not enough to win the Gold! Israel with 30.540 captured the shiny medal. Dana, Kalfa, Sach and Uralevitch who in the summer took bronze in the World Games turned out to be the polished diamonds of today and here in the city of diamonds became 2018 World Champions. Once again we would like to congratulate all medallists and finalists and thank everyone who’s been celebrating with us this fantastic festival of Gymnastics. 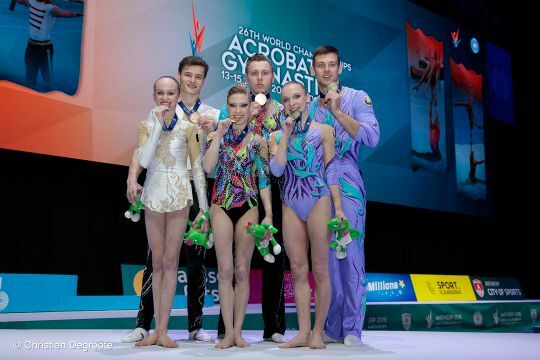 We could not be more proud of all gymnasts who demonstrated incredible strength and artistry but also determination, motivation and sprit and we are very thankful for the fantastic audience who supported the athletes here in Lotto arena, online and via social media, who made this event as tremendous as it was. Thank you!